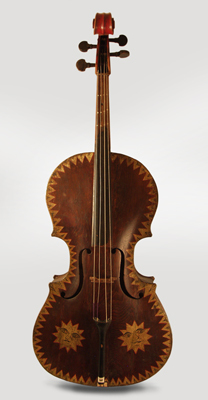 Painted New England Model Church Bass, c. 1825, made in New England, oil varnish with painted decoration finish. Height is 53 in. (134.6 cm. ), 19 1/2 in. (49.5 cm.) wide at lower bout, and 5 1/4 in. (13.3 cm.) in depth, measured at side of rim. Scale length is 28 in. (711 mm.). Width of nut is 1 5/8 in. (41 mm.). Restored to Excellent Condition.